I have to warn you. I was an idiot and had my camera the..uh…wrong way. So we got a lot of tight shots. But that doesn’t mean it isn’t like completely unwatchable, right? Check it out and you tell me. Of course it doesn’t take away from the popcorn, which rocks. 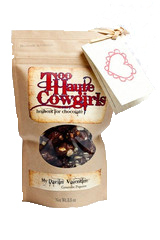 From dark to milk chocolate, and coffee to chili, banana chips and macadamia nuts, there are flavors for everyone here. This stuff is crack. Matty’s camera prowess…not so much. This was delish. Love what you’re doing her. Love what you’re doing HERE. Geez.